Russia, Iran and Turkey on Friday agreed to jointly monitor a fourth safe zone around Syria's Idlib province as part of the tripartite plan to ease the six-year conflict that has claimed around 400,000 lives. In a joint statement after two days of talks in Kazakhstan, the three powers said they agreed "to allocate" their forces to patrol the zone covering the opposition-held Idlib province and parts of the neighboring Latakia, Hama and Aleppo regions. It said that the zones will be formed for a six-month period and will be extended if necessary. The next round of talks will be held in late October, it added. Turkey, Iran and Russia will send 500 observers each to Idlib to monitor the de-escalation deal, and the Russian ones will be military police, the Russian negotiator said. In a separate statement released by the Turkish Foreign Ministry, a plan to establish a center for coordination was also announced. "In accordance with the agreement reached by the three guarantor states at the Astana meetings, observers from the three states will be deployed at checkpoints and observation posts to be established in the security zones that will constitute the borders of the de-escalation area. The principal task of the observer forces is defined as preventing the occurrence of hostilities between the regime and the opposition as well as to monitor any ceasefire violations. The activities of the observer forces will be coordinated by the Joint Coordination Center to be established by the three guarantor states," the statement said. "During the negotiation process regarding the Idlib de-escalation area, Turkey, as the guarantor of the opposition, played a decisive role in the implementation of the memorandum by taking into consideration the approaches and assessments of the opposition groups on the ground," a Turkish Foreign Ministry statement added. Turkish delegate was led by Foreign Ministry Deputy Undersecretary Sedat Önal during the talks. Yehya Aridi, a member of the Syrian opposition delegation at the talks, welcomed "any agreement that can stop the violence and stop the killing of the innocent Syrians." He called for the release of thousands prisoners still held by the government, saying "their issue should be discussed and dealt with as soon as possible." The three guarantor states, as well as representatives of the Assad regime and some opposition factions, are meeting in Astana for a sixth round of talks aimed at ending the six-year conflict. The U.N.'s special envoy on Syria Staffan de Mistura and delegates from Jordan and the U.S. are attending as observers. According to the Kazakhstan Foreign Ministry, Qatar is also participating for the first time as an observer. Turkey, which supports some opposition groups, and Russia and Iran, which back Bashar Assad's regime, have been holding talks in Kazakhstan since January. They are seeking to implement lasting cease-fires in areas where fighting has been heaviest between opposition forces and pro-Assad troops. 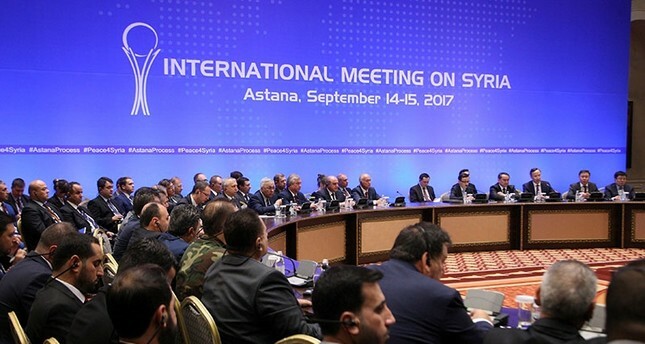 The parties previously agreed to establish four de-escalation zones, where intense fighting is taking place between the opposition groups and the Assad regime, at the Astana meeting held on May 3-4. According to a memorandum signed between the parties, the de-escalation zones would include areas in Idlib province and certain parts of the provinces of Latakia, Aleppo and Hama, certain parts of Homs province, eastern Ghouta and Damascus as well as certain parts of Deraa and al-Quneitra. In addition to the cessation of fighting, the de-escalation deals also include ending flights and air strikes by the regime or U.S.-led anti-Daesh coalition. At the fifth meeting on July 4-5, it was agreed that the parties would resume work on the borders of the zones. A separate deal was reached between U.S. and Russia in southern Syrian cities of Deraa and Quneitra, and Russian military police was deployed in the area to monitor the cease-fire which started on July 9. The Russian Defense Ministry also declared a cease-fire deal in the Damascus suburb of eastern Ghouta. Russia had also announced a cease-fire deal in Homs, however, the deal was only reached with an opposition group that has limited dominance in the area.